Attached is October 30 Sutra and Purusarth of the Day! Have a wonderful, blissful Purusarth day for firming up the Agnas! 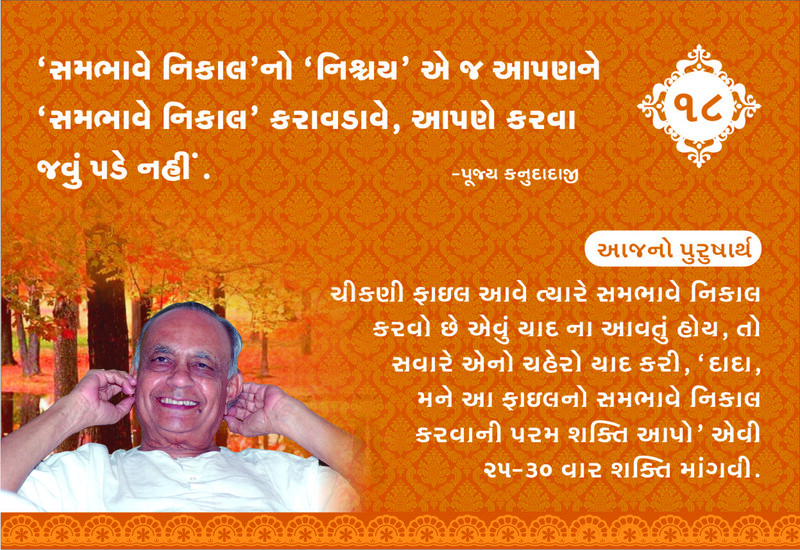 Make a firm resolution that today you will perform every activity with upayog(focused awareness). 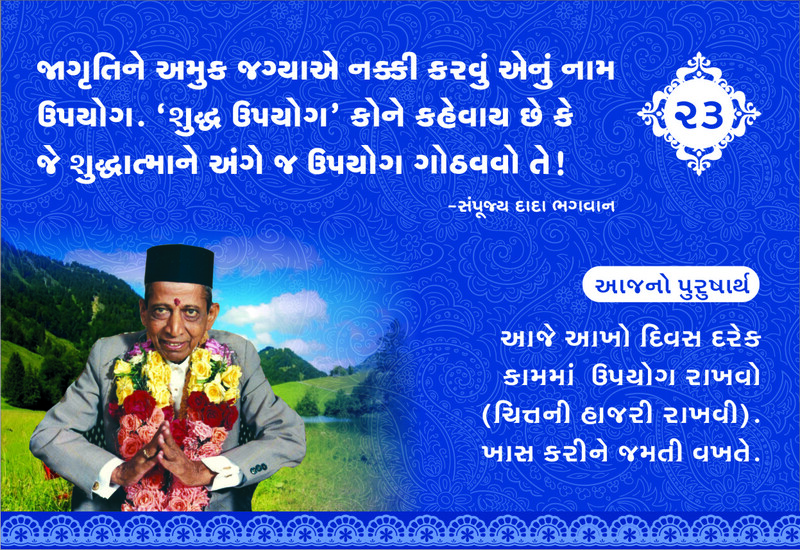 PAD – ‘Gnan’ panch agnama!…………. Please register on for automatic e-mail intimation of programs and updates. Attached is Oct 25 Sutra and Purusarth of the Day! Have a wonderful, blissful Purusarth day for firming up the Agnas! Our Bhave is to say, "Agna palvi saheli che !" 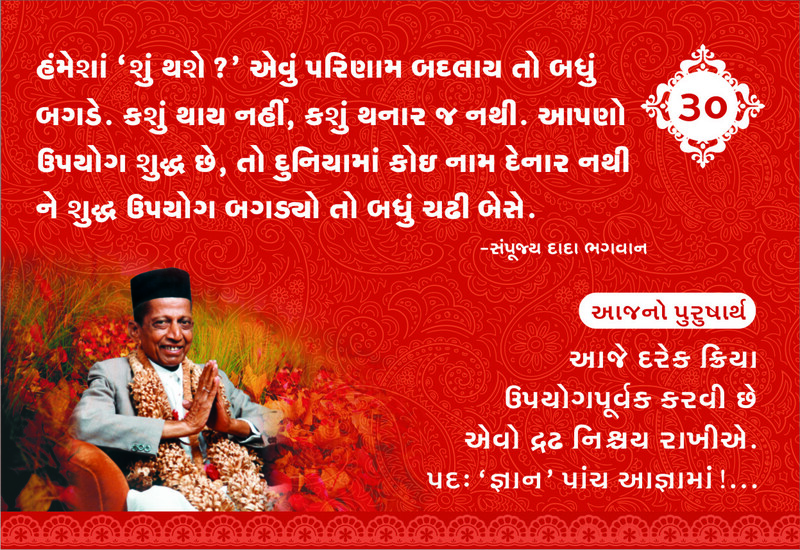 An affirmative answer to Kanudadji’s often asked question. Today consciously note that the ‘speech’ of others is a pre-recorded speech being played out from a tape-recorder. Attached is Oct 23 Sutra and Purusarth of the Day! Have a wonderful, blissful Purusarth day for firming up the Agnas! Throughout the day (keep upayog) be aware of all the activities that you do. i.e. be attentive – have presence of chitt. Especially while eating. Attached is Oct 18 Sutra and Purusarth of the Day! Have a wonderful, blissful Purusarth day for firming up the Agnas! If you are unable to remember to amicably settle when a particular person (chikni File) comes, then in the morning recall that persons face and repeat, ‘Dada, please give me the ultimate strength to settle amicably with this person’, 25 to 30 times. Then you will be able to do so.